The Pastor and I disagree on this one diaper. Typically we have the same opinions on diapers, but for some reason he hates this diaper. He hates it more than any other diaper we own, which is crazy to me! Just an example of one person’s favorite being another person’s trash! 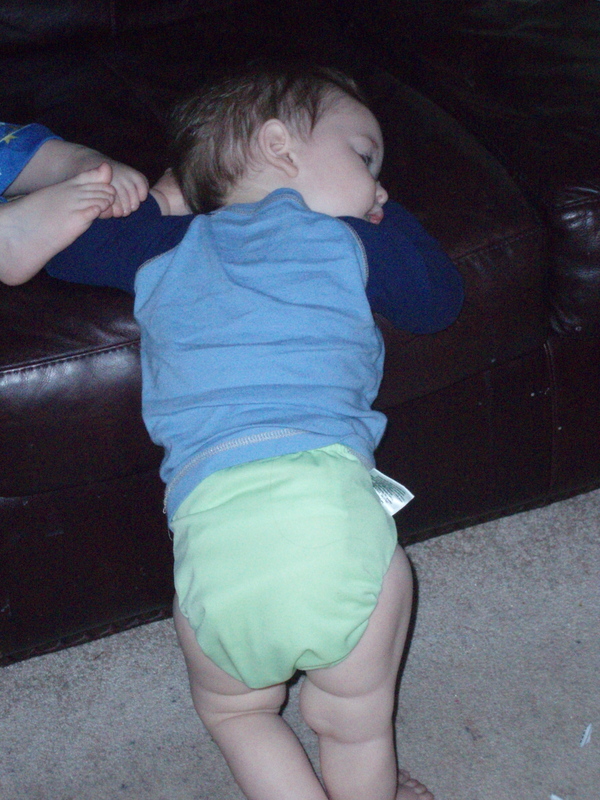 The bumGenius One Size Organic All-In-One Diaper will cost you about $24.95 a diaper, new. The interior is layers of unbleached organic cotton. The exterior is PUL with snaps. Only the inside of this diaper is organic! If you want a completely organic diaper system , you’ll want to go with Bamboo or organic cotton fitteds. (And if being natural and organic is a big priority for you, you’ll probably want to go with wool covers.) But the part of this diaper that is on your baby is organic. Since the interior is just a knit cotton (think T-shirt material) it does not wick moisture away from baby’s skin. It feels wet against them and for that reason is not the best choice for a night time diaper. I do love that it has snaps and not the blasted bumGenius aplix. That blurry picture is an attempt to show you the breakdown of the interior that has occurred after a little over a year of use. There are holes in the outer layers (in various places) of the interior fabric. None of them go all the way through, it is just simple breakdown caused by daily use and washing. 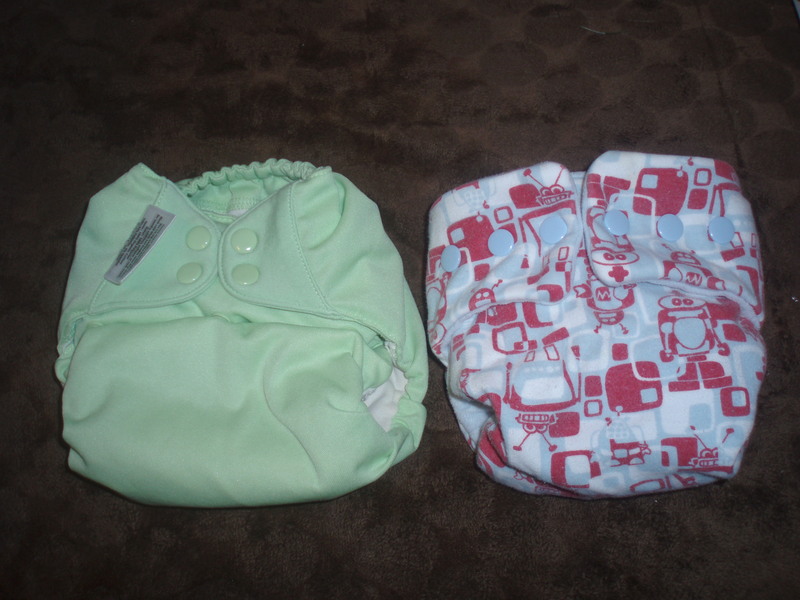 The above photos show the bumGenius One Size AIO Organic Diaper with newborn fitted diapers. 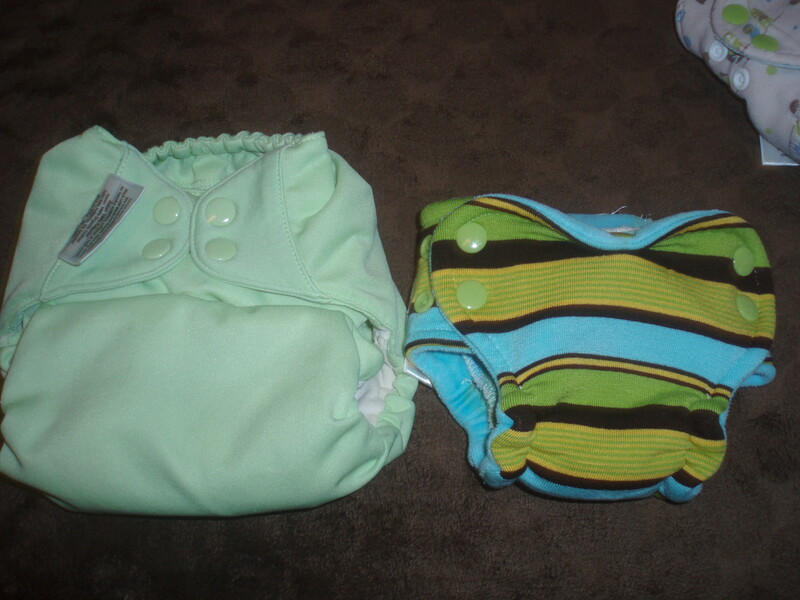 (The top is with a Nanipoo Newborn Fitted Diaper. 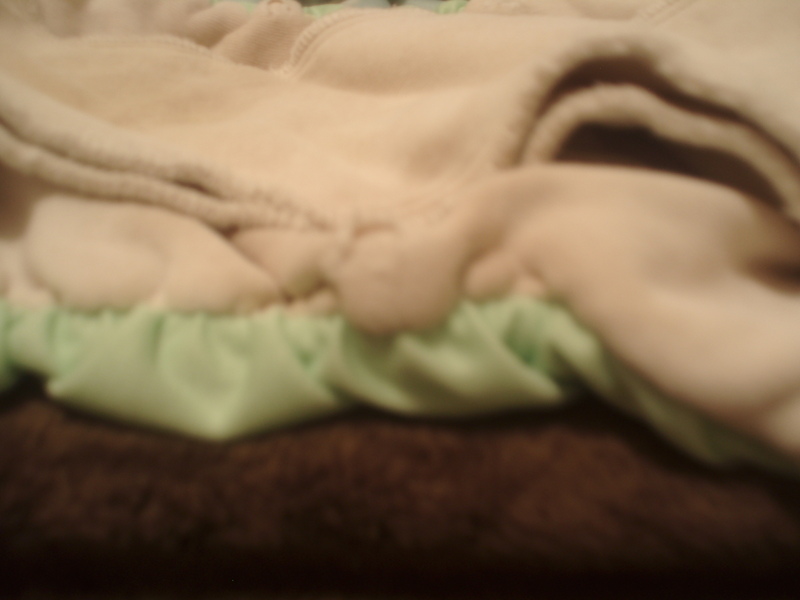 The bottom is with a Graham Bear Wear Newborn Fitted Diaper.) The bumGenius Organic One Size AIO is not going to fit a small newborn. I suppose if you have 10 lb. babies, they will work from birth. Realistically, these diapers fit from about 8 lbs. (a rolly 8 lbs.) to about 30 lbs. They do not fit my 38 lb. 3 year old. These diapers take a little longer to dry than pocket diapers. They take me about 2 and a half cycles in the dryer to dry. If your whole stash is built from these, the extra drying time would make little to no difference. If you have a few of these in your stash, it can be maddening to take all your diapers out of the dryer and have to return these for another cycle or half cycle to finish drying. They also don’t hang dry well. It takes them a very, very long time to dry. They have the ingenious bumGenius feature that keeps the interior from rolling out. They sew a small strip on the PUL into the top front of the interior, so if anything “flips” out a little, it is just this little bit of PUL. Which is great to prevent wicking. Do I recommend these? Well, with the all-in-on you get a very easy no fuss diaper that is ready to go once you eventually get it dry. It is a very convenient diaper for babysitters, church nursery workers, and grandparents to use. There is little room for error. In addition, there is no pulling inserts out, so when it is dirty you just toss it into your diaper pail or wet bag. So, it is easy. They are also very trim. It is a little awkward to add doublers into it, but you absolutely can if you need to. If convenience is what you are going for, then this diaper would be a nice choice. They are pricey and they seem to have a shorter life span than other diapers I’ve tried (though still longer than their brother, the bumGenius 3.0), but you may be willing to trade that for the convenience factor. If you have to use a daycare for your child, you can sometimes get them to use cloth diapers if you have something very simple like these! So keep that in mind! The Pastor would tell you to steer clear of these completely, but I disagree. I think they have their market and their uses. If you are not so concerned with convenience, then you may find yourself frustrated with these, since convenience is the main thing they’ve got going for them. If you need something cheaper, try Tweedle Bugs– they are a similar fit, though they are a pocket diaper and they are half the price! 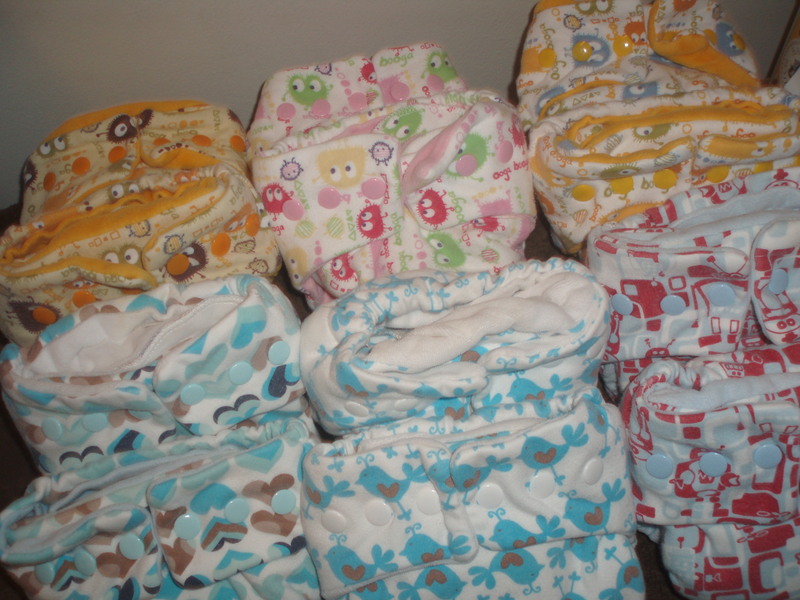 I purchased 12 Wild Child For Babies All in One diapers before Emery was born. I paid $100 for the dozen, so the price was great! The Pastor was not sure about the fitted diapers, so I bought some All-in-Ones for him, since he said he would prefer that. These diapers were very large for newborn diapers. In fact, they are closer to a size medium Prowrap cover than a newborn. (They could be a small, but I never had a small cover, so I couldn’t say.) I kept trying them on Emery because I wanted them to work. They have no umbilical snap down or scoop. They are large. 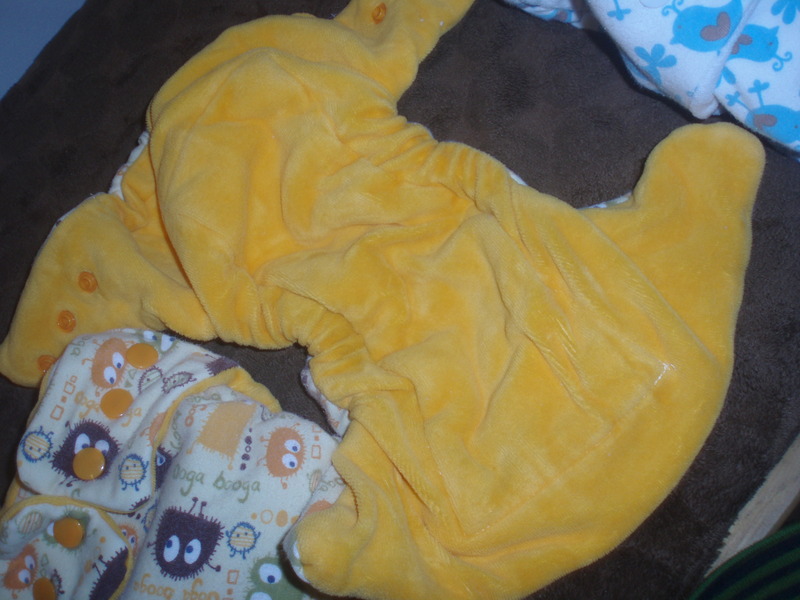 Around 8 lbs, they began fitting Emery, but I had such trouble with leaking. I ended up using them as a fitted because I never could get them to not leak. They fit from a rolly 8 lbs. to 15 lbs.or more! Maybe a thinner, but large baby would have had better luck. I’m not sure. I put one on 25 lb. Aidan one day & they fit him though they were a bit low rise. And they did not leak on Aidan. I was super quick to change him, but I can say they did not leak. I may pull them back out and see how they work on Emery now. I tried them again when he was around 16 lbs., but they didn’t fit well. They were tight on his thighs and still leaked. 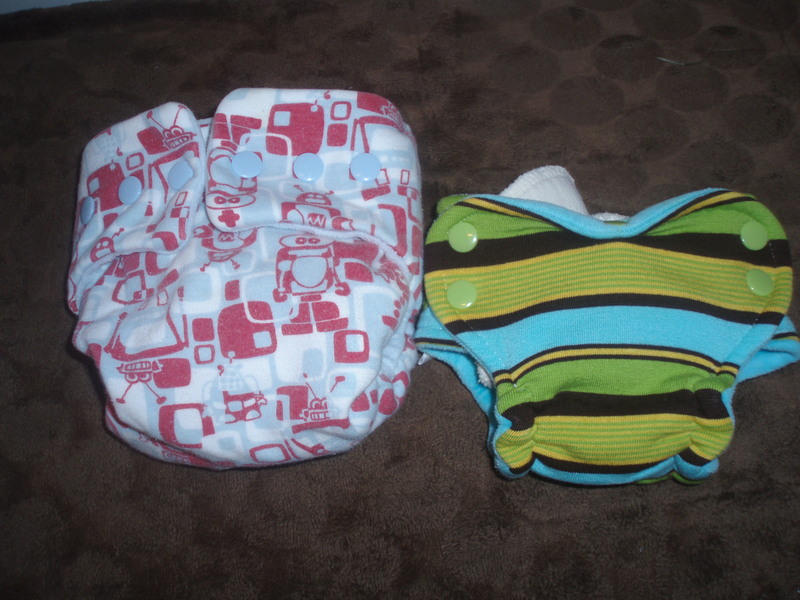 A side by side comparison of a Newborn Wild Child For Babies All-in-one and a bumGenius One Size Organic All-in-one. Both on their smallest settings. 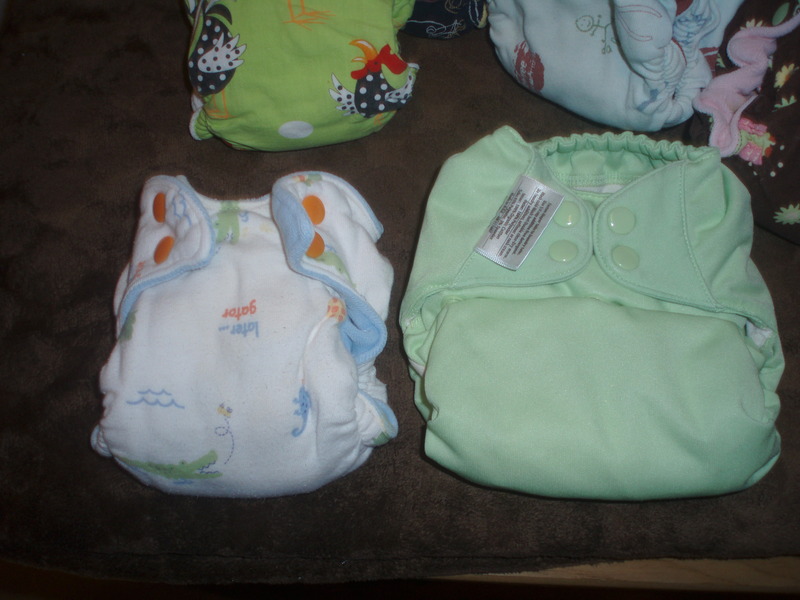 Side by side comparison of a Newboren Wild Child For Babies All-in-one and a Newborn Graham Bear Wear Fitted. Wild Child is on the smallest setting and the Graham Bear wear is on the “medium” setting. Wild Child for Babies newborn all-in-one diapers have cotton velour interior. Mine had the cute cotton knit fabric on the outside. These diapers are not very trim. They take FOREVER to dry. In fact, The Pastor used to complain about how long it took our bumGenius organic all-in-one to dry, but once we started using these, he was wishing they dried as fast as the bumGenius all-in-one! Seriously, these took me 4 dryer cycles to dry. If you hang them, they’ll be hanging for over 24 hours before they are dry! These do not have a scoop or snap down, so you have to wait until the baby’s umbilical cord stump falls off before you can use these. Do I recommend these diapers? I can’t. They did not work for me. If that changes, I’ll let you know. And here is where I insert a disclaimer. Not every diaper works for every baby. Some people adore the diapers I hate. Some people hate the diapers I adore. Wild Child for Babies may work perfectly for some. They just didn’t work for me.